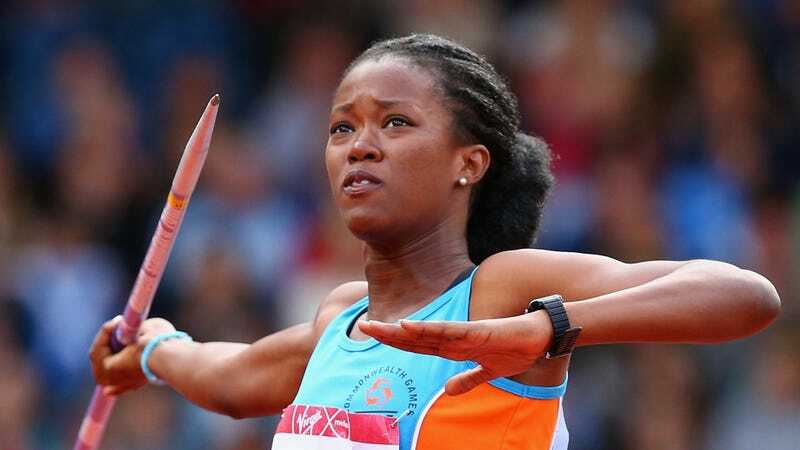 Dee-Ann Kentish-Rogers of Anguilla competes in the Women’s Heptathlon Javelin at Hampden Park during day seven of the Glasgow 2014 Commonwealth Games on July 30, 2014 in Glasgow, United Kingdom. Here’s what you call a game-changer: For the first time in its 66-year history, Miss Universe Great Britain—the qualifying pageant for the Miss Universe competition—gave the crown to a black woman. But the history-making honor didn’t go to your average pageant queen; winner Dee-Ann Kentish-Rogers is a heptathlete with a head full of gorgeous locs, making her not only the first black woman to capture the crown in Britain but also the first to compete in a major pageant wearing dreadlocks. I can honestly say there is no better gift [than] having our first black winner to celebrate 10 years in [my] job. Dee-Ann is a true role model for all women of all skin colors and with her dynamism off the stage, coupled with her presence on the stage, I genuinely believe Great Britain has a chance at the Miss Universe crown this year. The difference I want to make is simply representing for women in general and in particular Women in Sports. I want to raise the profile of women in sports so that they will be able to gather more sponsorship and representation in the media. I am also very passionate about seeing equal pay opportunities for women in sports. This is where I want to make a difference.